Rebecca Ashling and her staff of 35 hospice nurses, social workers, chaplains, aides and volunteers provide specialized care to about 75 patients a day throughout the city and suburbs of Portland, Oregon. They are part of the highly regarded non-profit home care practice of Housecall Providers, an experienced team of 91 physicians, nurse practitioners, physician assistants and other medical professionals serving more than 1800 in-home patients a year with everything from proactive primary healthcare to end-of-life counseling and care. Hospice patients are often scared, depressed, and easily agitated. The clinicians with the right technology tools and solutions at their fingertips are often the most poised to provide the best patient care. The advancement in medical documentation wasn’t without its drawbacks and barriers to success. For starters, the portable computers simply weren’t portable enough. The laptop-based documentation system required a good Internet connection to operate as well. Wi-Fi is not always available when clinicians need it to document in-home patient visits or when they’re on call or covering for another clinician and need emergency access to a patient’s medical records. “Clinicians and patients can get very frustrated when the very technology that’s designed to improve documentation and streamline operations routinely gets in the way of effective patient care,” Ashling says. Faced with detracting from their patient’s overall well-being, many Housecall clinicians opted to document their patient visits after hours, late into the evenings at their own homes. Understandably, that often led to overworked and tired staff, lost personal time, documentation accuracy and morale concerns, and a team reluctant to use the laptop documentation system at all. On top of all that, the laptops and the documentation system installation, maintenance and per-user licensing fees combined put a major strain on the non-profit healthcare provider’s operations budget. Driven by the pursuit of optimal patient care, Housecall Providers and its Board of Directors were in search of a new level of clinician and patient friendly point-of-care documentation capabilities. 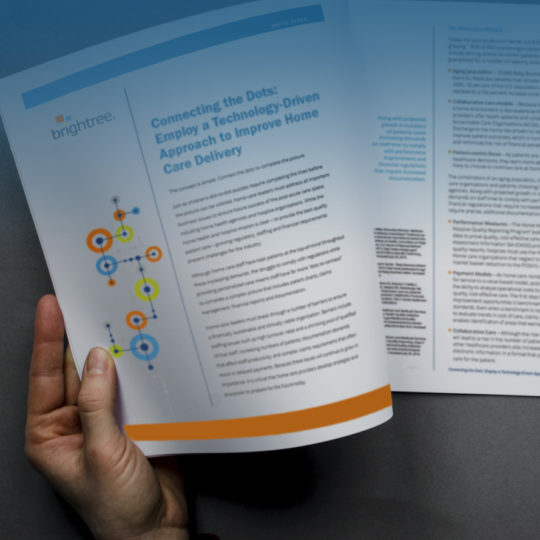 Their new documentation solution had to work seamlessly in real-time throughout the day in the life of a Housecall Providers clinician. It had to subtly blend in naturally with the patient visit and even enhance patient care. Lightning-fast navigation in a device that features a far smaller footprint and price tag and requires no Internet access were absolute musts. Housecall Providers points to the intuitive design at the core of the Brightree Hospice software solution as perhaps the biggest breakthrough of all. Improved patient care tops the list of benefits that Rebecca Ashling and her hospice team at Housecall Providers attribute directly to the Brightree Hospice software solution. “We are now able to provide the best possible calming patient care and document the visit with an innovative solution and device that enables our clinicians to complete the vast majority of our documentation at the point of care. The more we can document in-home care observations real-time, the more accurate those charts will be,” Ashling reports. She estimates that the speed and reliability of Brightree on the iPad has led to a 50 to 60 percent improvement in documentation accuracy across her team. “Not only did the walls come down with patients when we moved to Brightree, our clinicians’ resistance to what had been a laborious and slow documentation effort has been replaced with trust and confidence in the Brightree platform,” Ashling says. Ashling cites the ability to quickly move from documentation to built-in iPad apps like Skype calling and iTunes music and videos as an important part of the agency’s approach to personal touch hospice care. And not only have technology and hardware costs been cut by 70-percent, the easy-to-use Brightree solution has nearly eliminated the need for training. The intuitive nature of Brightree Hospice software makes it easy to learn and easy to integrate into an in-home care setting. “It now takes far less time to successfully document a patient visit and those visits are far more engaging and revealing with Brightree at our fingertips,” Ashling says, noting that the entire team is now equipped with the cost-effective Brightree solution on the iPad. Even in emergency situations, when a patient’s trusted clinician is not available, an on-call care giver can instantly tap into the Brightree system and fill in without missing a beat. They simply sync up with the agency’s database and gain immediate authorized access to the affected patient’s medical care documentation for a complete healthcare picture before arriving at the hospice patient’s home.